Earlier this week as I was coming down Centre Street back to my apartment, I was shocked to see that Pondside Reality, where Yorgos helped us found our place on Rockview, had been reduced to a charred shell. 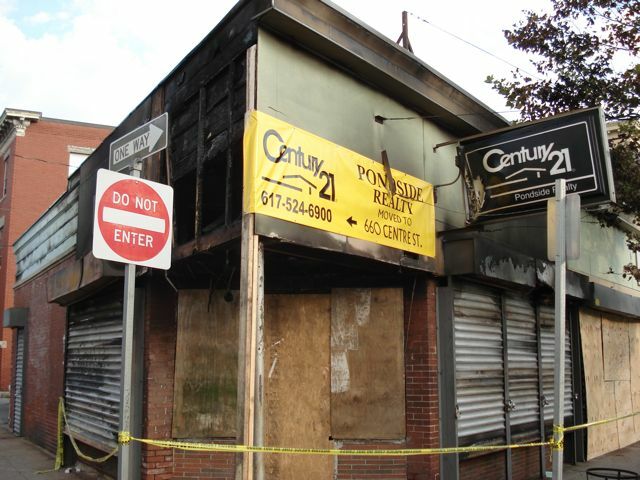 I soon learned that this was the fourth incidence of arson involving JP businesses in little over a year. My sympathies go out to Yorgos and the rest of the employees there, and I hope they can get to the bottom of this despicable string of crimes. This entry was posted in Neighborhood, Photos by Tim Lindgren. Bookmark the permalink.